A three day meeting of Marist provincials and vicar provincials from Australian, Oceania, the Philippines and New Zealand concluded Saturday morning. The Superior General of the Society of Mary, Fr John Hannan SM was also in attendance. 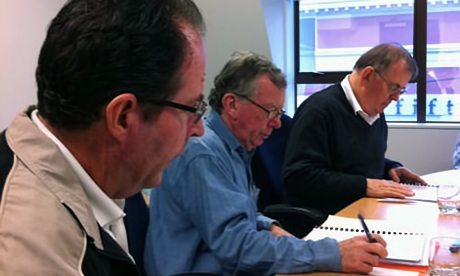 Frs Ben McKenna (Provincial Oceania), Peter McMurrich (Vicar Australia) and John Hannan (Superior General) at 2013 Wellington MAP meeting. The Marist Asia Pacific (MAP) annual meeting, hosted this year by the New Zealand province in Wellington considered reports from all the regions, the international Marist Governance Review, the International Finance Review, vocations promotion, the formation of Marists and the collaborative works of the four units and sharing of personnel. On Friday night Marist priests and brothers from around the Wellington area joined the MAP delegates for a social function at Pa Maria, a Marist spirituality centre in Wellington. On the conclusion of the meeting, the Superior General travelled to Christchurch where he visited the Marists and thanked them for their work amongst the people of earthquake stricken Christchurch. After lunch Fr Hannan was given a tour of the city where he could see first hand the devastation the earthquakes.